I agree with Joyce on this. Bettman picks his language carefully and it’s no mistake he added the remark “…as we stand here today”, leaving enough wiggle room to suddenly announce the Coyotes relocation when the league is ready. Look no further than Atlanta where 1 week before their own relocation announcement Bettman used a similar clarifier (“as we have this conversation today”). “National Hockey League Commissioner Gary Bettman says at this moment, he expects the Atlanta Thrashers will stay right where they are. 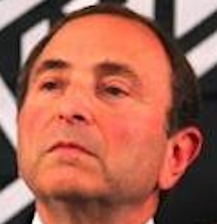 It would be foolish to expect Bettman to say anything but status quo until the NHL is ready to say otherwise, and that’s why you hear clear lies such as “we haven’t considered alternatives” or other insulting statements. But to imagine the league doesn’t have a Plan B ready after 4 years is ludicrous. I fully expect this will play out with the NHL shoving a buyer in front of Glendale and say “give us that Jamison deal again or we walk” and wiping their hands of this mess by blaming the city for not cooperating when they say no. Perhaps a fitting end for this joke.